When you think of the best places to shop on Anna Maria Island, what do you imagine? So many things make Anna Maria Island the paradise that it is. Sandy beaches, bright sun, wildlife, and SHOPPING! Whether it be a stroll on Pine ave or a brisk walk on Bridge Street, the island is full of shopping potential. Top 10 best places to shop on Anna Maria Island. Bella By The Sea carries a wide variety of clothes geared for modern women who are all about comfort, and also offers home furnishings that are Renewed, Refurbished, or Recycled. Named after her English Bulldog Bella, Jo-Ann Lefner opened Bella By The Sea because she was inspired by the quaint northern end of Anna Maria Island. To find Bella by the Sea on Facebook click here! Special selections of imported silver jewelry from Bali, Denmark, Italy, South Africa, and Tibet as well as locally hand-made jewelry will suit your individual personality.If you would like to see their website to take a closer look at what The Hive has to offer, click here! 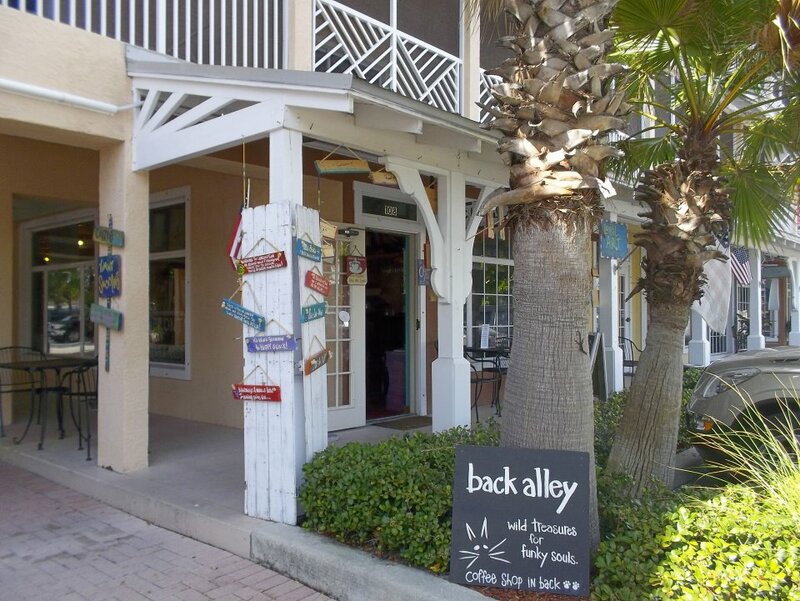 Local is the order of the day at Back Alley on Bridge St. work from local artists, a full gift shop and a wine and beer bar round out Bridge Street’s most quaint shopping option. To find out more about Back Alley click here! Artspace Studio & Gallery, located above the Post Office on the north side of Palm Ave, Anna Maria, is the quirkiest little gallery on Anna Maria Island. Artists in residence, Deborah Webster and Lex Halakan along with select friends, show their original creations and hold regular classes to help bring out the inner creative in all of us. To find more information about Artspace and what they have going on click here! Tide & Moon provides some of the most unique hand-crafted jewelry to shop on Anna Maria Island. This Pine Ave shop, located next to a A Room with a Hue, is where you can find the super cute Anna Maria Island pendants that you may see while spending time on our island paradise. To see what Tide & Moon has to offer click here! The Sand Dollar Gift Shop is one of Anna Maria Island’s finest for its ambiance and style. Surround yourself with the great smells of exotic scented candles and stones for the home. It’s previous location was just off the island in the Cortez Fishing Village. Now, A Room with a Hue has the cutest hand-painted furniture on Anna Maria Island. To find A Room With A Hue online click here! Bikini’s, board shorts and the beach are what you’ll find at West Coast Surf Shop. An island staple for decades, West Coast Surf Shop carries the latest in ocean side trends in their second story shop along the Gulf of Mexico. Don’t forget to check out the mural by island artist Chad “Cheeta” Ruiz along the north facing wall of the building. To follow West Coast Surf Shop on Facebook click here! A rich variety of art by talented local and regional artists awaits the art lover at Island Gallery West. To keep up with what’s going on at Island Gallery West click here! Bridge Street Jewelers is the the first certified master jeweler and gemologist to the island. They were also the first to introduce the Anna Maria Island destination bracelets. To find out more about Bridge Street Jewelers click here!